Our Canadian Unit: the 49th parallel propels us into action – While reading about Canadian provinces, and we came across this: British Colombia, Alberta, Saskatchewan, and Manitoba border the United States along the 49th parallel north. WHAT???????? It was like our alarm clock clanged! It was obviously time to learn about parallels, longitude, latitude and the like. 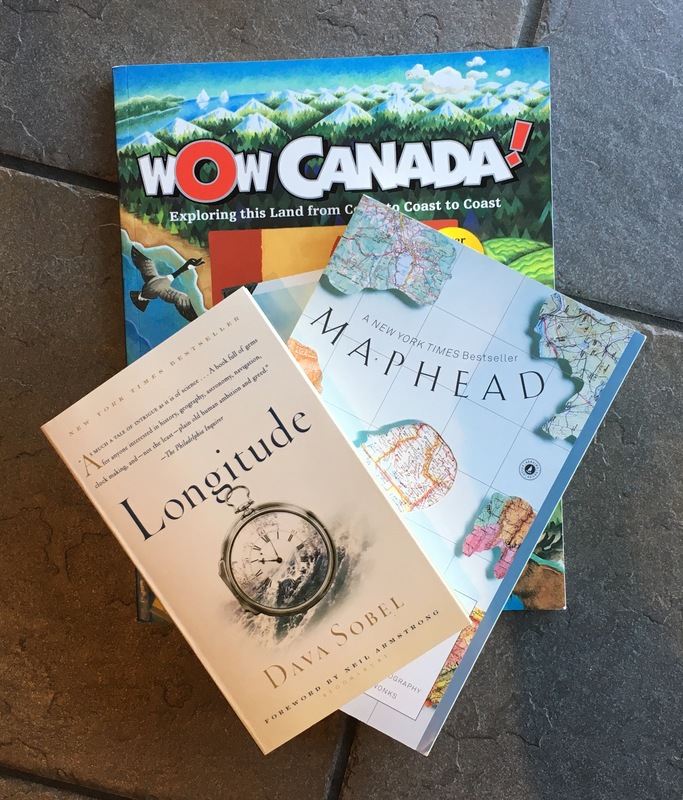 So, two books to the rescue: we’re reading through the scholarly and quite fascinating “Longitude” by Dava Sobel, and “Maphead” by Ken Jennings is on deck. BTW, “Wow Canada!” by Vivien Bowers is proving to be an excellent resource. Fiction Fun – We were sorry to finish two entertaining books this past week: our 10th Tom Gates book, “Top of the Class (nearly)” by the utterly imaginative Liz Pichon (gosh we love those Tom Gates books) and a revisit read of Gordon Korman’s insightful “Schooled” (important read). We’ve just begun “Olivia Bean Trivia Queen”, written by Donna Gephart, a new author for us. So far: YAY! – We have just finished “Presenting Buffalo Bill” – We’ve impressed ourselves by absorbing the material of Candace Fleming’s long, brilliantly researched book. We probably learned EVERYTHING about this over-the-top man, a LOT about the myth of the “wild west”, and a BIT about some unsettling American government policies of the late 18th century. – A side note: Buffalo Bill fits the profile – My son and I have studied many “larger than life” individuals whose impact has been significant. To a person, the greater the achievement, the more glaring the personal deficit(s) (vocab). William Cody fits the profile. Poor Bill – literally POOR BILL – had no concept of money management. Although this is a comparatively benign (vocab) deficit, how could his friends and family not shudder in horror as he plunged unthinkable quantities of money into one ill-advised investment after another. Oh Bill! Back to our Canada studies: WE DID NOT SEE THIS COMING – Here we are knee deep into our unit on the Canadian provinces, learning about the Royal Canadian Mounted Police, the Calgary Stampede, the Canadian Shield, poutine, puffins, prairie dogs – lovely, lovely, lovely and then, WHOA: smack in the middle of Canada, in the province of Manitoba: THE NARCISSE SNAKE DENS. SNAKE DENS!!!! We had to drop everything, find out more and look at GROSS WRIGGLING PHOTOS. OK, here is the deal: every spring and fall, thousands and thousands of red-sided garter snakes congregate for a three week mating frenzy.